Things have been busy in camp LKB. I got hitched this Summer and then spent 3 weeks traveling and sightseeing in the Western states. It was really fantastic to get away from the Internet for a time and be immersed in the outdoors with no schedule whatsoever. But I’m ready to play some music again, and I’m in luck: today begins two weeks of tour dates around the Midwest with my buds Brett Newski and Frank Schweikhardt. I’m really excited to hit the road and see these cities again, and hopefully YOU! I write from the Catskill mountains in the living room of our new friend Dan. The last four days we’ve been precariously driving up and down dirt roads through the mountains, playing music, making friends, and taking in the beautiful Empire State scenery. And arguing about Tom Cruise, of course. We kicked off our tour with 3 great shows in Ohio, and then headed to Colgate University in Hamilton, NY. The drive in was rural and mountainous and we began wondering if our friends in the band Rabbit In The Rye were just pulling our leg and maybe we were going to end up at a dead end dirt road in the middle of nowhere. Finally we say the lights of a football field and ended up playing a really fun show in the college pub. Brendan and Alex from RITR put us up for the next three nights at the beautiful old farmhouse where they live with a cat named Garbage and 3 chickens. All three bands packed up and went to Rochester the next day, where we played in a bar that previously housed a brothel. From the looks of the scenery driving through town I think we probably played the sweetest spot in Rochester. We had just as much fun in the old farmhouse as we did on the road, where a few good natured tour tiffs began, and I quote “you just told me there’s an alien god who did this this and this, but you don’t believe in TOM CRUISE! ?” Our drummers, Zachary and Sean, act like brothers in the single digits. After leaving the farmhouse with a pancake sendoff from our new buddies in Hamilton, we decided to spend our day off in Cooperstown, NY. But before we got there our GPS tried to kill us. Much like Colgate University, Cooperstown is in the middle of the mountains and is accessible via rural roads up the mountains or highways that wind around the mountains adding miles along the way. Our GPS decided to take us on the shortest route, which was both scenic and terrifying. Maybe we should name it HAL. Keep in mind that 7 of us are packed to the gills in a minivan pulling a packed to the gills trailer. Jimmy did an excellent job of navigating the mountains with the poor van working overtime, and we made it in all of our collective pieces to the birthplace of baseball. Some of the dudes went to the hall of fame while I wandered around with Jon, Jimmy, and Zak Attack. New York is a beautiful state. One week down, three to go. I love traveling with this crew. This incarnation of the LKBand, Jon and Zachary, is really top notch and it’s a lot of fun to play with them every night and then get rock and rolled by The Dead Records. Hopefully we’ll be rolling your way soon. I am very excited to announce that Jon Autry and I are starting a record label. The stars have aligned (astronomically, not astrologically), and I feel that this is the time and place to create a home for future releases and an umbrella under which we can bring other artists that we believe in. Our first release will be the split 7″ between LKB & Co. and The Dead Records, featuring our A sides on vinyl and a digital download including our B sides. Full-length records from both Jon and I are also in the works. From the bottom of my heart, thanks for your support through the years. I look forward sharing more music with you via Usonian Records. Speaking of sharing music… You can win a test pressing of the split 7″! We’ll be randomly selecting one of the label’s twitter followers and one facebook liker to win a test pressing and be among the first ten people to hear these recordings, ever. So follow us on twitter AND like us on facebook to double your chances. See you around the Internet, and around the country in April! 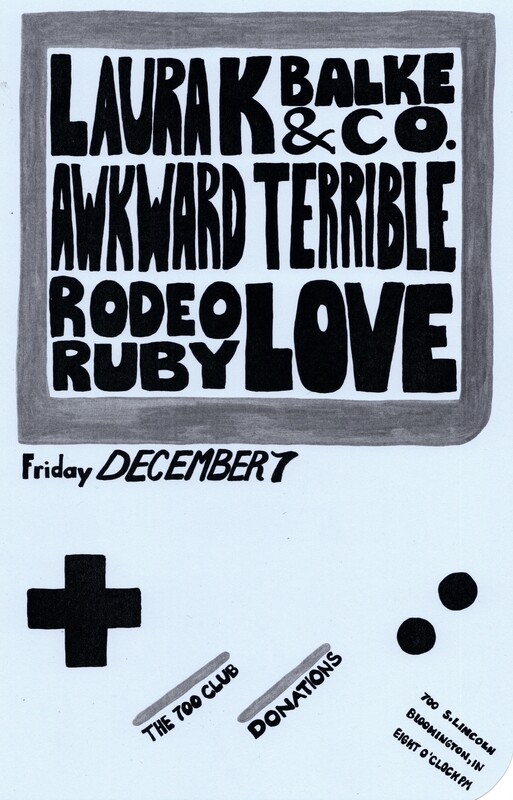 This weekend we’re playing three shows with the best post punk chiptunes band on earth, Awkward Terrible. Zachary and I met AT when we played in Milwaukee this spring and were completely blown away. Immediately we began plotting to bring them to Indiana. I’m excited that all the plots are coming true! The Holidays Don’t Have To Be So Rotten! Speak for yourself, Balke. I love this time of year. The title of this post is actually a benefit instrumental compilation that I’m honored to be a part of! Last year my contribution was comprised entirely of musical instruments I’d received as gifts, with the exception of guitar. 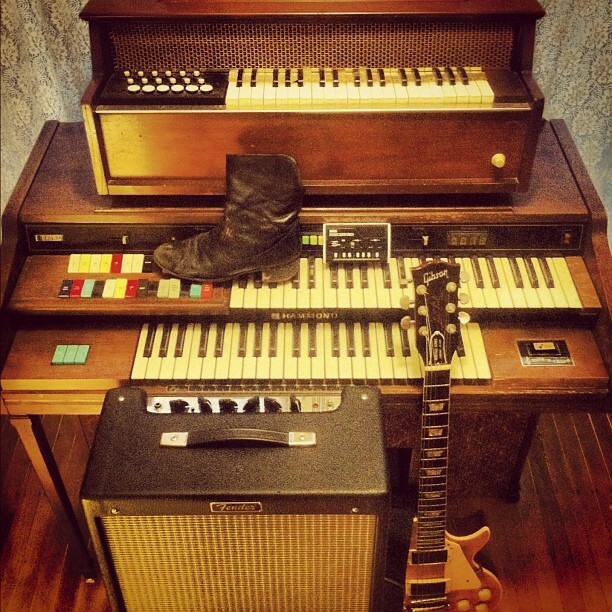 This year my song centered around a Hammond organ that came on hard times and ended up in my parent’s garage, and is now residing in my living room. Jon Autry (who is also featured on the comp!) 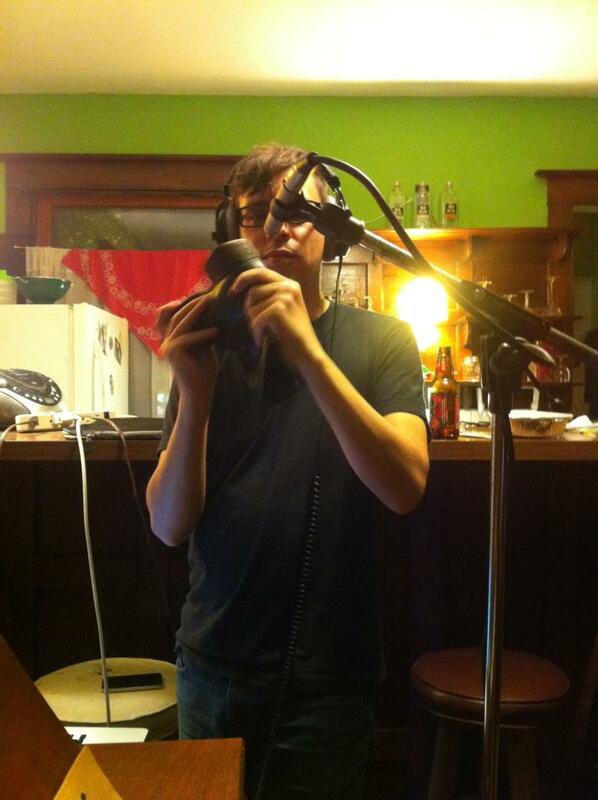 recorded the song, and decided that it was high time my Maraca Boot made it’s musical debut. I’ve had a rock stuck in the heel of my favorite pair of boots for over a year now. This year in addition the digital album you can even get a mug featuring Gavin Smith’s artwork or a Christmas card with a digital download code! All proceeds benefit Middle Way House, a safe place for victims of sexual assault and domestic violence, and will be used to buy gifts for children currently staying with their mothers. There’s two hours of original instrumental cheer and it’s sure to spice up your holiday music collection. For my Indiana folks, I’ll be a part of the official release show on Monday, December 3 at the Bishop. The Flannelgraph folks tell us there will be free pizza and Santa! See you there!